The Dogs took control over the Cats in the second term and it showed on the scoreboard as they scored three goals with the breeze and kept the Cats scoreless. 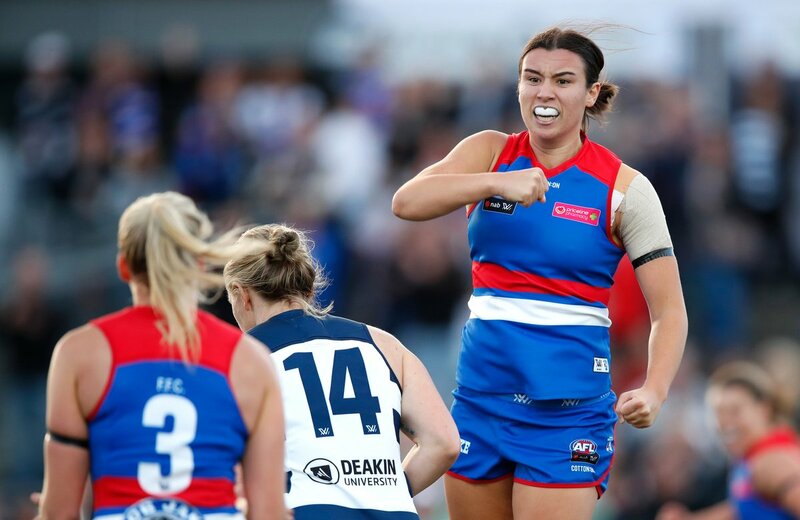 Dogs placed immense forward pressure on the Cats defenders and it opened the forward line up for Deanna Berry who kicked a classy running goal and the first of the second quarter. An another quick entry from the Dogs into their forward 50 and Bonnie Toogood slotted through the major. Ellie Blackburn with a great goal from 45 metres and it was three consecutive goals for the Dogs. Lauren Spark was a stalwart in defense for the Dogs with her intercept marks. Cats steadied late in the second quarter and it created one stoppage after another. At the main break the Dogs led by 16 points over the Cats. Dogs and Cats both scored a goal each in the third quarter. Cats had lots of forward entries but could not make the most of their opportunities. Cats debutant Georgia Clarke kicked her first goal in the AFLW and first of the third quarter. Soon after, Dogs debutant Aisling McCarthy the Irishwoman from Tipperary responded with her first AFLW goal. At three quarter time the Dogs had the ascendancy of 14 points over the Cats. Deanna Berry placed a solid bump on Aasta O’Connor and O’Connor came off second best. Cats and the Dogs both were goalless in the final quarter. The Dogs remained dominant with their pressure inside their forward 50. There were repeated stoppages at the start of the final term. A great desperate effort from Ellie Blackburn who put her body on the line in the Dogs forward line. The Dogs were more polished than the Cats all over the ground and when the Dogs kicked with the breeze they took full advantage of this on the scoreboard and this was the difference in the match in the end. The Dogs were the dominant team and recorded their second win of season three by 18 points over the Cats and they remain undefeated. McCarthy had a impressive debut with a goal, 6 disposals and 5 kicks. Monique Conti played solidly all match with 15 disposals. New Cat Meg McDonald played superb against her former team with 18 disposals. Kirsty Lamb with 17 disposals.